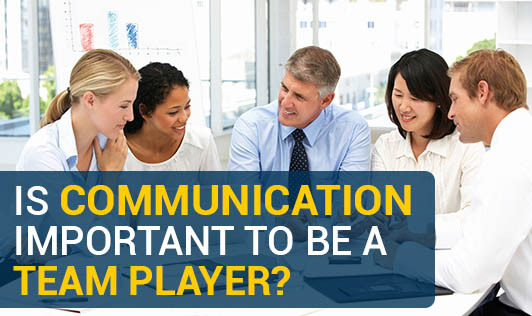 Is Communication Important To Be A Team Player? Almost everyone has worked in teams at some point in their lives. Within those teams, communication is crucial between all members, regardless of what role each person plays. Whether it is between two team-mates on a sports team or two managers in a corporate office, communication is vital to success. Effective communication: Team-mates must develop trust, since it is not automatic. Accordingly, members must communicate more openly than they normally would in everyday life. There must be honesty on all ends of the team, since withholding the truth could damage the team’s integrity. Benefits of communication: Teams that communicate complete projects in a quicker and more efficient amount of time than others. They also are more accurate in their work than others. Effective communication also allows team members to understand their roles and the roles of everyone else on the team. Consequences of lack of communication: Teams that fail to communicate effectively end up wasting time and energy doing other work that is not required because of a lack of understanding of what needs to be done. This often leads to conflict within the group and a lack of trust between group members. Recipe for successful communication: Good communication, mixed with strong organizational support, competence among the group leaders and clear group objectives can lead to the highest level of success in teams. Among these factors, good communication is most important for success. Communicate and work the magic!